In 2007, I was new to DDB, having been appointed chief communications officer at the storied advertising agency. One of the first memos that hit my desk was a “heads up” that Doyle Dane Bernbach was going to be featured in a new television series. Creator Matthew Weiner had consulted with the agency prior to production and my arrival, but we did not know how we were to be treated in the storyline for Mad Men. Fast-forward eight years, and I am happy to say that DDB fared the best in the quips and portrayals of Madison Avenue agencies (poor McCann!). I can honestly say that I would have watched and been loyal to the show regardless of my employer or career. It has been an amazing trip through my adolescence and profession, as well as, our history and pop culture. Now that the final season has started, I’m feeling nostalgic for all of the nostalgia the show provided. Mad Men was cleverly premised on investigating the past by monitoring the effect of change. Throughout, we have been witness to troubled public and private lives, personal struggle, and even surrender in the face of social upheaval. The series has addressed race, gender roles, war, free love, assassinations, office politics, infidelity, addiction, and occasionally, advertising. On the last subject it has been surprising that so little discussion has taken place on the impact mass production coupled with mass advertising had on society. This commercialism turned people into consumers and products into brands, and we have never been the same. It is amazing that given the volume of work from this era, each notable agency can cite only a small number of standout campaigns. 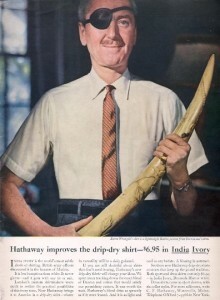 For Ogilvy & Mather, it is The Man in the Hathaway Shirt who sported a black eye patch adding mystery to his decision to wear only Hathaway shirts. The roguish adventurer drove sport cars, sailed yachts, courted women, held an elephant’s tusk, and inspected a shotgun all in the same crisp white shirt. Leo Burnett, the agency and the man, loved using cultural archetypes. His agency invented mythical personalities that held American values at their core. He created the Jolly Green Giant, Tony the Tiger, the Pillsbury Doughboy, and the Marlboro Man. Burnett kept a folder in his desk called “Corny Language”. He told his people, “Make it simple. Make it memorable. Make it inviting to look at. Make it fun to read.” Burnett took the world and turned it into a living cartoon where satisfaction and fulfillment could be bought. The ratio of truly memorable and effective work in the Mad Men era is quite horrendous but not dissimilar to efforts today. This is Weiner’s overriding thesis for the show: our world is similar in many ways to the one 50 years ago, just shinier and glossier — or new and improved. Writing in, The Past Isn’t What It Used To Be: The Troubled Homes of Mad Men, Mark Taylor wrote “Mad Men’s producers reanimate ’60s iconography in order to level it.” Of course, I am speaking about amazingly accurate portrayal fo the era through the costumes, hairstyles, sets, language, inside jokes, and pop culture references. On many an episode, I spotted an ashtray, chair, decanter, shag carpet, stereo, or poster that had once inhabited my family home. Combined, the characters and sets only emphasize how staged life was back then. Many of my friends’ homes in the ’60s and ’70s had immaculate living and dining rooms that no one was allowed to enter except on the most special of occasions (remember the plastic that adorned couches?). 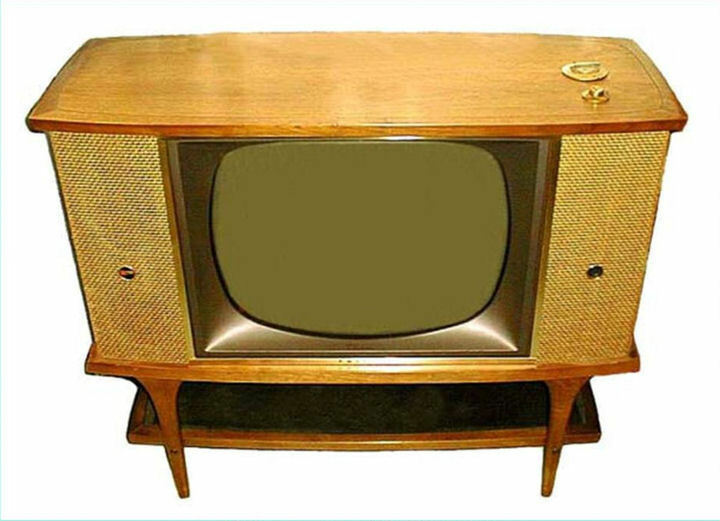 In essence, many of us lived on a television “set” while we watched the television set. 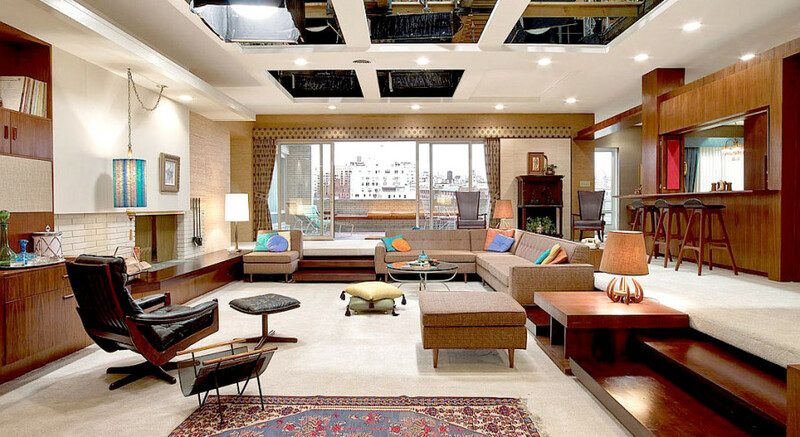 Manhattan acts as more than a backdrop in Mad Men; it is a multi-layered character adding to the show’s richness. The locales are meticulously researched, yet shot in Los Angeles adding to the irony of image over substance, an ongoing critique of advertising. Not just the center of the ad industry, New York was also a hub for innovation. Its famous department stores alone introduced ideas like window displays, designer collections, and branded shopping bags. Classic restaurants from that era are honored in the series including Lutece, Sardi’s, and the Four Seasons. The El Morocco, The Slipper Room, P.J. Clarke’s are among the bars singled out. Iconic Manhattan hotels appear including The Savoy Plaza, The Roosevelt Hotel (the first to include retail stores), and The Pierre. Yet, there are a few errors to be found. Admittedly, precious few given the rigorous research. One occurred in the first season. Office manager Joan Holloway stealthily reaffirms her authority over secretary Peggy Olson when she tells Peggy she is to be promoted to copywriter. Joan obliquely takes credit by saying, “Well, you know what they say: the medium is the message.” However, Marshall McLuhan’s famous slogan became popular in 1964 and not in 1960 as depicted in the show. I know … I am nitpicking, but I am a big fan of the Mad Professor. This ubiquity and popularity turned on him. As the preeminent communications and technology theorist, his raft of ideas on “electronic communications media” and how it impacted human thinking, interaction, and collaboration came to be labeled “McLuhanacy”. But now McLuhan is back. I found this out on a visit to Facebook headquarters in Palo Alto. 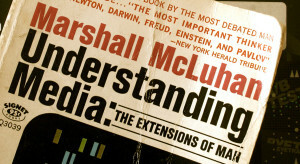 A too-youthful executive shared that McLuhan is required reading at the social network. I spotted plenty of copies of Understanding Media and The Gutenberg Galaxy among the cubicles. Essayist Lewis Lapham credits McLuhan’s resurgence to the accuracy of his predictions or as The Globe and Mail phrases it, he “makes a lot more sense now that so much of what he foresaw in the 1960s has come true”. 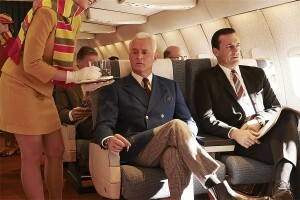 The narrative complexity of the storytelling in Mad Men is what appealed to me the most. It focuses on continuity over closure, so I expect that not everything will be wrapped in a tidy and pretty bow at series end. This fractured form of storytelling has made Mad Men’s re-telling and re-evaluating of the past both creatively and innovatively inspired. That sounds wordy, but you get the point: Weiner has repositioned history much like an advertising professional repositions a cola, confectionary, or a car. He is clearly fascinated with the 1960s, but the show is meant to parallel the changes we have experienced in this past decade. Weiner is interested in knowing whether people in tumultuous times recognize the change going on around them. 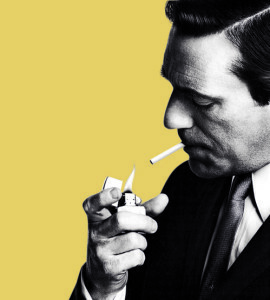 By watching Mad Men, we become more cognizant of our own lives. At its most basic level, the series centers on capitalism, clear gender roles regarding the sexes, the evolution in racial politics, and unchecked hedonism. Those topics make for a great soap opera, but Mad Men’s appeal is in the search for deeper meaning and connection. All the struggles and conflicts that make up the storylines are predicated on a rejection of the status quo. In this sense, the series is akin to an episode of The Twilight Zone or The Outer Limits. The characters are trapped in a world they have contributed to but one in which they desperately want to escape. Every episode has them running from their current circumstance only to land firmly back in it. It is a nightmare of their own making. But if that’s what the show is about, why pick on advertising? The answer is quite simple. The people in the industry were seen as colorful mavericks. They ran counter to the ubiquitous gray, drone-like middle managers that were the subject of sociologist William H. Whyte’s 1956 book The Organization Man. In Analyzing Mad Men, the book says “conformity was the enemy of creativity and, therefore, productivity” so ad men appeared highly productive and appealing as anti-heroes. What it really means is that a show that took place at IBM, Bethlehem Steel, or General Electric in the early ’60s may not have had the same appeal. As someone in the profession, I enjoy the brain-teasing conundrum put forth in Analyzing Mad Men of “the contradictory notion that any ‘mass’ marketed product has the capacity to individualize anyone.” The show also accurately portrays an ongoing dynamic in the industry that “everyone in this office is always competing with each other, even if they do not seem to be doing so.” We see Sterling Cooper at its best when it bonds together and pitches new work or delivers a new campaign. Today, employees of ad agencies still forget that the real competition is outside of their office. Everything else is just internal politics. There is also the observation that the agency has been ineptly run and managed. When successful, it is a mystery even to themselves. In Analyzing Mad Men, one essay suggests the agency “is resistant to adapting its strategy to a changing media landscape, often underestimating the impact of new media (e.g., television), new products (e.g., imported small cars) and demographics (e.g., youth culture)”. Weiner gets it right when he has Sterling Cooper merge, sell, re-merge, combine and monetize in different forms. Such activity is representative of the insecurities and fear that permeates the industry. My wife is a psychotherapist, and having been exposed into the basest aspects of that profession, I found the most jarring plot line was Don’s denial of his half-brother Adam. Don refuses to have him in his new life and the resulting suicide was horrific. As such, the psychological issues related to Don’s “family of origin” make for meaty material especially when he is more devastated over the loss of his fake wife. 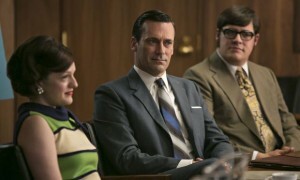 Analyzing Mad Men suggests this “alienation from his family is one of the show’s clearest examples of the real world’s failure to deliver on the promises given us by capitalism.” Don searches for real family throughout each season, and we, simultaneously, want him to attain it and to fail in the attempt. We want to punish him for his stylish indiscretions but have empathy for his tortured history. Much has been written on the drinking in Mad Men. Dissatisfaction masked in frequent celebration seems to be the primary motivator for the generous imbibing. As a reader of everything John Cheever and Richard Yates ever published, I have to advance a related theory: many of the men from that time were experiencing post-traumatic stress from World War Two and the Korean War. Richard Yates’ short story, The B.A.R. Man, is but one example of how these guys came home from the war, largely conformed, and decompressed with booze. B.A.R. is short for the Browning Automatic Rifle, but stands in for the veteran’s drinking habits. Having served in the war holding this heavy weapon, he now conquers Manhattan’s drinking establishments believing that the days when he was scared shitless in combat were the best he ever had. Mad Men does a great job telling a similar storyline through the character of Freddy Rumsfeld who was a killer of many Germans, came home to write light and fanciful advertising copy, and then battled alcoholism. I often wonder what the reaction would be if Mad Men were broadcast in the times it portrays. Would those actually living then recognize themselves? Like Weiner, I was born in 1965, and also like him, I wonder if the obsession with the period is one based on and nurtured by shallow representations rather than its reality. In the end, I believe Weiner is celebrating the era while exposing the contradictions and the confusion felt by those who lived it. On a personal level, the show has accomplished something I never expected. I now have an even deeper appreciation for my parents. My father was 35 in 1960. He was a lawyer with a bar in his office and one in our paneled basement. My mother was 25. She gave up a start in journalism to raise four children. I have a clipping from the Winnipeg Free Press society page from 1961 showing them at a big event. The beehive hairstyle piled high on my mother’s head dominates the photo, but then you see the fur wrap and cigarettes. I thought of them and their relationship throughout the series. This is what Weiner is after. The show is a subtle and subversive command to reflect and connect with our past. It is curious that the show has been delivered via television, the medium that has been supposedly declining in relevance since its introduction. We should admit that television has been the essential storyteller of our times and is now reinvigorated by Mad Men and its backer AMC. Soon the last episodes will play. We will gather in front of our large flat screens just as we have since the time televisions were smaller and powered by tubes that needed time to warm up. Don will finalize his quest or not. He will share sage, yet flawed, wisdom we have come to puzzle over and quote. We will hang on his every word and action because we are looking for answers. Mad Men has made us reconsider our relationship with the past, and in so doing, challenged us to determine how different it is from the present. When the final credits roll, we will all agree that Matthew Weiner has proven his thesis: our own anxieties, hopes, complexities, and dreams are not that different at all.